Woohoo! I did them all! This LO is for Christina at http://www.thriftysisters-chris.blogspot.ca/ . Her challenge was to create a LO or Card with either a Canada Day or Independence Day theme. I remembered to take some pictures at our little Canada Day BBQ so I was able to participate :). 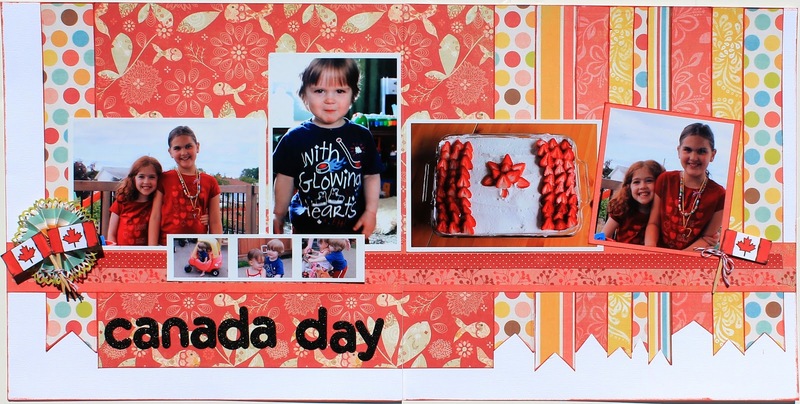 The Canadian flags are from Microsoft ClipArt and are printed on a textured white cardstock. Beautiful, bright layout. Love the use of the washi tape. Great job,awesome to see another Canadian scrapper on here.That cake looks yummy! Gorgeous layout !! Love the design and the colours! CropChocolate.com Banner of a Blog Hop! Sneaky Peek! Blog Hop Friday!! !